Co-editors Danielle Herinckx, Sophie Kenney and Jabul Rasmussen of Henley High School’s new quarterly magazine “The Blue and Gold” show off copies they picked up from the printer Friday. Which 1960 Henley graduate was an Air Force pararescueman who jumped from a plane to retrieve the Gemini III space capsule and pick up its astronauts after it landed in the Atlantic? Who was the first female student to receive a letter for a varsity sport at Henley High School? The answers to these questions and more can be found in articles in the first edition of Henley High School’s “The Blue and Gold,” a 20-page, glossy magazine featuring students and alumni. The magazine, the first of what will be a quarterly publication, was written, designed and published by the school’s new media class. Sabine Graetsch, a junior at Henley High School, delivered a speech at stem cell therapy at the State FFA Convention last year, earning second place. “Stem cell therapy is providing a more efficient form of treatment that will get animals back to pre-injury condition in the shortest amount of time,” she writes. You can buy the first edition of “The Blue and Gold” by contacting Henley High School, 8245 Highway 39, Klamath Falls, OR 97603; 541-883-5040. Cost is $5. Issues can be ordered and mailed for $5 plus postage. For a preview of its articles and to place an online order, click here. Students in the class, spearheaded by Henley High School teachers Robert Chambrose and Carlos Becerra, combine their talents and resources to produce both the school’s annual yearbook and the new magazine. Co-editors Danielle Herinckx, Sophie Kenney and Jubal Rasmussen are in charge of the magazine, assigning stories to student writers and editing and designing the publication. As they flipped through its pages last week after picking up copies from Smith Bates Printing and Design, they were already critiquing and evaluating how to improve the next issue. Co-editor Danielle Herinckx and media class teacher Robert Chambrose look through copies of the first edition of “The Blue and Gold.” Chambrose co-teaches Henley’s new media class with Carlos Becerra. Among featured stories in “The Blue and Gold” is college advice from a 2017 Henley alumni attending Portland State University and an in-depth profile on golden stiletto heel owner Shannon Carlson, the Henley English teacher who not only teaches but also coaches basketball and is an accomplished artist and dog trainer. Another section highlights alumni by decades, featuring the 1970s, 1980s, 1990s, 2000s and 2010s. The media class of about 30 writers and a half a dozen editors is in charge of the magazine and the school’s annual yearbook. Yearbook editors – Braidy Smith, Randolph Duran, Jeffrey English and Zachary Cheyne-Russell -- have met some early deadlines and are focusing on articles and art that tell the story of the 2018-19 school year. “The Blue and Gold” editors are planning and assigning stories for the magazine’s next edition. The students in the class were hand-picked by Chambrose and Becerra for their motivation and abilities. 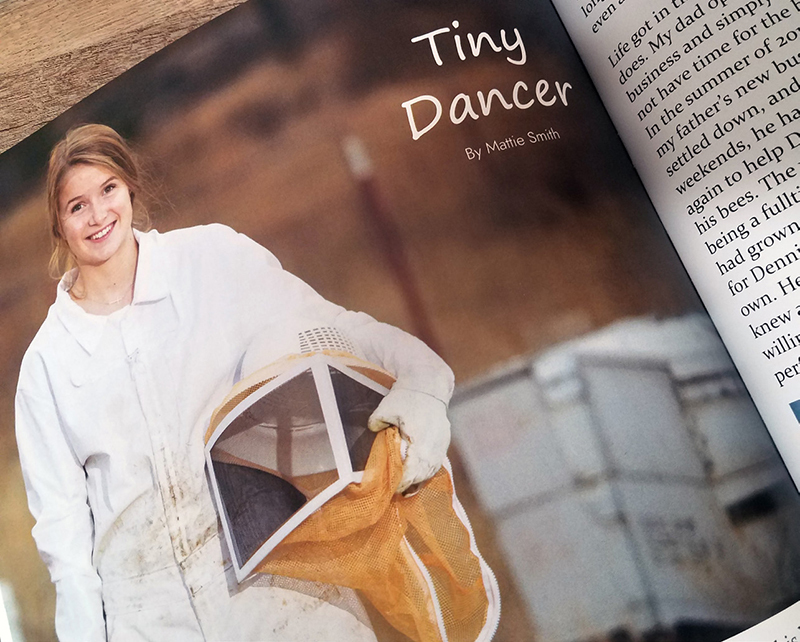 One of 10 feature articles in the magazine was written by Henley senior Mattie Smith. Becerra, a talented artist, photographer and designer, felt the same so the two Henley teachers decided to collaborate. Chambrose and Becerra said the support of the Henley administration, from technology to providing them the time and resources needed, has been invaluable, allowing the class to put out high-quality products. “We both enjoy working with excellent students so starting this class was a great way to have that opportunity,” Chambrose said.